No, I haven’t got a chance to get a taste of this season’s first mulled wine yet, but I will, soon. When I’m not quite as tired as I am at the moment (no thanks to a bizarre sleeping pattern that I couldn’t explain) then perhaps I can get more into the spirits of winter celebration and go all out! I was passing the Christmas market on Champs-Élysées quickly this evening. 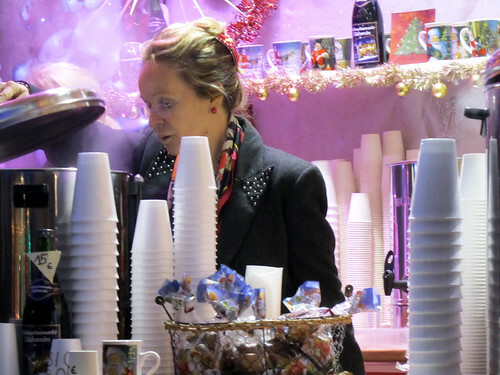 It is a little chilly out, so the queue for the mulled wine was not inconsiderable, given this is only a Monday evening. It’s a pity though this stall only sell the wine in Styrofoam cups. It would have been nice to get them in ceramic mugs (great hands-warmer), even if it costs a bit more. The cup can then be kept as souvenirs. That’ll be what I call a strategy from Selling 101.
ps: you’re selling manchester hard at me but the new apt moving thingy is costing me a small bomb already so can’t spend frivolously at the moment, boo. same here, saving up for trip back soon for my bro’s big day!